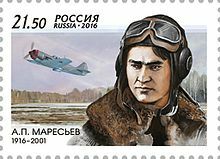 Alexey Petrovich Maresyev (Russian: Алексей Петрович Маресьев; 20 May 1916 – 19 May 2001) was a Soviet fighter ace during World War II. Maresyev was born in Kamyshin to Russian parents. His father was a skilled laborer who died shortly after he had returned from World War I. Before joining the army in 1937 Maresyev worked as a turner and then participated in the construction of Komsomolsk-on-Amur. In 1940 he graduated from Bataysk Military School of Aviation. He began his flights as a fighter pilot in August 1941. He had shot down four German aircraft by March 1942, but on 4 April 1942 his Polikarpov I-16 was shot down near Staraya Russa, almost certainly by future Knight's Cross holder and 48-kill experte Fw. Peter Siegler(3./JG-54) and was nearly captured by Nazi forces. Despite being badly injured, Alexey managed to return to the Soviet-controlled territory. During his 18-day-long journey his injuries deteriorated so badly that both of his legs had to be amputated below the knee. Desperate to return to his fighter pilot service, he subjected himself to nearly a year of exercise to master the control of his prosthetic devices, and succeeded at that, returning to flying in June 1943. During a dog fight in August 1943, he shot down three German Focke-Wulf Fw 190 fighters. In total, he completed 86 combat flights and shot down 11 German warplanes. He was awarded the Golden Star of the Hero of the Soviet Union (24 August 1943), the highest military decoration of the USSR. In 1944, Maresyev joined the Communist Party and two years later retired from the army. In 1952, Maresyev graduated from the Higher Party School. In 1956, he obtained a Ph.D. in History and started working in the Soviet War Veterans Committee. Eventually, he became a member of the Supreme Soviet. He died of a heart attack on 19 May 2001, just an hour ahead of his official 85th birthday celebration. His story served as a basis for the novel by Boris Polevoy The Story of a Real Man and a subsequent film (1948) directed by Aleksandr Stolper where his name was changed to Meresyev. The novel also inspired Sergei Prokofiev's last opera The Story of a Real Man. In 2005 a documentary called Alexey Maresyev. The Fate of a Real Man was produced by Channel Russia. ^ "Маресьев Алексей Петрович". Retrieved 27 March 2017. ^ "Fw. Peter Siegler details". ^ "Fw.Siegler was the only Luftwaffe pilot claiming I-16 that day(04 Apr 1942), note that JG 54 was operating in the same area as A.P.Maresyev". Wikimedia Commons has media related to Alexei Maresiev. (in Russian) Алексей Маресьев: "Я человек, а не легенда!" This page was last edited on 23 November 2018, at 12:20 (UTC).